The Charleston Fire Department proudly protects 54,000 people who live in an area of 33 square miles among the green hills and valleys surrounding the Kanawha and Elk Rivers. Charleston is the Capital of West Virginia and is the state’s largest, most populous city. Three interstates converge in Charleston, Interstates 64, 77 and 79, linking the Midwest cities to those in the North, East, and South. The metropolitan area surrounding Charleston is much larger, with more than 200,000 people commuting into the city for work and recreation. The Charleston Fire Department has an ISO rating of two and operates out of eight stations with 171 paid professionals. These stations house eight Engine Companies, one Ladder Company, one Rescue Company and four Advanced Life Support Ambulance Units. The Fire Department is also home to the West Virginia Regional Response Team Task Force One and houses Building Collapse and Hazardous Materials Units. The members of the department are specially trained in fire fighting, emergency medical services, vehicle rescue, technical rescue, hazardous materials and water rescue. 1991-1997 Carl E. Beaver Sr. The first firefighting battalion was formed in Charleston, consisting of two hand pump wagons. Their headquarters were in the old Academy Building on Quarrier Street. In the event of a fire, they were summoned to the station by a triangular shaped, hand gong by striking it with a heavy hammer. They would then pull the pump to the nearest water source, climb onto the wagon and manually operate the pump to force the water to the fire. By-laws and constitution of Steam Fire Engine Company No. 1 were drafted and published in a booklet and given to the members. It stated that persons were elected as contributing members of the company upon payment of an annual fee of $5. Article 15 of the by-laws and constitution outlined the uniform standards. The uniform consisted of a black eight ribbed fireman’s hat and a red flannel shirt trimmed in black velvet collars and cuffs, black velvet heart on the chest with a red No. 1 in the center. The members were fined ten cents for missing a meeting and twenty five cents for missing a fire call. While the President and Vice-president were fined twenty five cents for missing a meeting. The 1875 by-laws were similar to the current by-laws except that it was expressly forbidden for the firemen to throw water on each other. On January 19th, Charleston’s worst early fire took place. The business block bounded by Kanawha Boulevard, Summers Street, Virginia Street and Capitol Street were destroyed by fire. The official name of the department was the Kanawha Steam Fire Engine and Hose Company and the official roster was as follows: Stalnaker Wellington, President; Joseph Teezell, Vice-president; Thomas J. Newhouse, Secretary; Allen Saunders, Engineer (four generations of Saunders have been on the Charleston Fire Department); Albert Booker, Chief Piperman; and Richard Stalnaker, Director of Hose. Charleston Mayor John P. Hale used his own funds to purchase an ultra-modern Silsby fire engine and presented it to the city. This unit weighed between three and four tons and required more than man power to pull it to fires. Horses were used to pull the apparatus to fires and the first horse drawn company in Charleston was placed into service. Charleston builds its first fire hydrant system. Before this the fire department had to rely on the Kanawha River, Elk River and cisterns that were located in various parts of the city for water to extinguish fires. The city fathers deceided that they had enough money in the treasury to have a paid fire department. The first paid fire department in charleston consisted of three men, W. “Bud” Callahan (who became the first Fire Chief) R.J. Stalnaker and L.C. Roy. The begain their duties on December 14, 1893 with the Silsby engine, a team of horses and fifteen alarm boxes. Motorized equipment begins to replace the horse drawn apparatus. The Charleston Fire Department has it’s first line of duty death. On March 7th, William M. Cabell, was responding to a fire when the steamer and horses he was riding on was hit by a street car fatally injuring him. 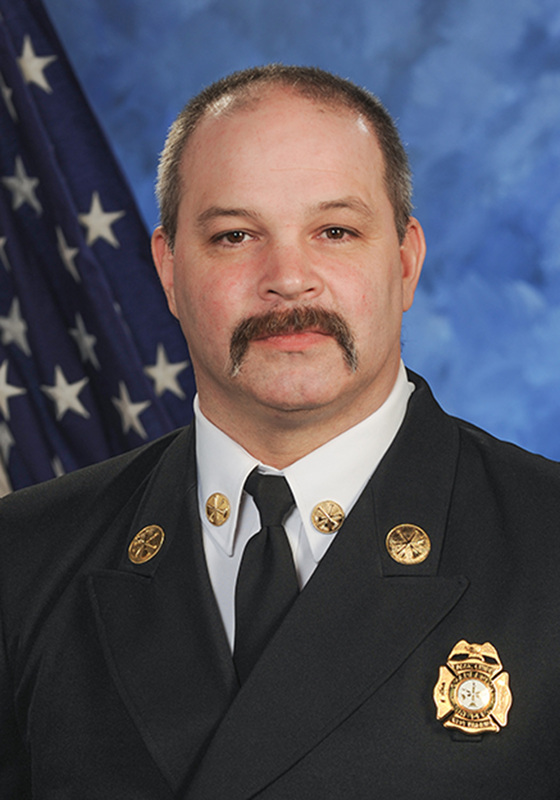 The Ruffner Brothers Fire claims the life of Firefighter Jack Foley. The Charleston Fire Departments receives two steam pumpers, the Kanawha and the Continental. They were built by the Ahrens Fire Engine Company in Cincinnati and remained in service throughout the 1920’s. The Continental was sold for scrap metal during World War II while the Kanawha was “rescued” and is on display at the Charleston Civic Center thanks to the efforts of a few firefighters and the firefighter’s union. On January 3rd, the West Virginia State Capitol caught fire and burned for several hours in Charleston. Charlie Walker died in the blaze and four others were seriously injured. Among those seriously injured was Charleston firefighter, Oscar Thaxton, and in March of 1922 succumbed to his injuries. On May 5th, the last response to a fire by a horse drawn apparatus in Charleston is made. Pictured on the last run are Firefighter Roe Miller, Firefighter Sanford Walker, Captain J. H. Hamilton and Driver Joe Jones. On September 7th, the Charleston Fire Department Professional Firefighters are chartered Local 317 by the National Association of Firefighters, later to become the International Association of Firefighters (IAFF). Charleston Professional Firefighters Local 317 is born. The Fleetwood Hotel fire, on July 19th, was one of the largest early fires in the city. Eleven hose lines were deployed and damage was estimated at over $300,000. The “Kelly Shift” is introduced to the firefighters. They would now work 24 hours and then be off for 24 hours. Every three weeks they would have three days off in a row. Prior to the “Kelly Shift”, firefighters would work either a 6am to 8pm or a 8pm to 6am shift alternating every two weeks. They would work seven days straight and have one day off. The firefighters shifts change to 24 hours on duty and 48 hours off. On July 19th, the worst church fire in Charleston’s history occurred, totally destroying the Sanctuary of Christ Church United Methodist on Quarrier Street. While undergoing renovation, the fire started in an interior hall where the oil-based paint supplies were stored. The fire traveled up the interior wall and into the ceiling structure of the entire building. Chief Britton designs and implements the fire departments first official patch. Chief Britton re-designs the fire department patch. The capitol dome, in the center of the patch, would later be updated by Chief Stanley in 2009. On June 26th, the fire department merges with the Charleston Emergency Medical Service (CEMS). The CEMS had been in service since 1972 and was originally named the Charleston Emergency Ambulance Service.